Rising inflation has hit the headlines, sparking some attention from journalists. What most mainstream investors don’t realize, though, is that history shows inflation can quickly get out of control, and not just in some mismanaged third-world country. Surprise spikes in inflation have occurred right here in the US—and given the massive amount of currency dilution around the world over the past decade, a jump in inflation could easily kick in again. Most historical inflation studies only go back to the 1970s. But as Mike Maloney has always taught, the further back you go in history, the more you can learn about the future. I ran across a study by Amity Shlaes, an author with an impressive bio. Her research found several examples from the past 100 years when US inflation started mildly but then soared to alarming levels. What’s perhaps even more startling is that those inflationary spikes occurred within just two short years. The official inflation rate in 1945 was 2%, but surged to 14% within a mere 24 months, a 7-fold increase. The CPI registered 3.2% in 1972, and hit 11% by 1974. Worse, it continued to march higher over the decade, peaking at 14.7% in April 1980, in what amounted to a near 5-fold rise. In other words, there is clear historical precedence that inflation can rise suddenly and rapidly, and that prices can quickly spiral out of control. It would thus be dangerous for us to assume that inflation will stay subdued indefinitely. Many analysts believe inflation will continue to rise, so let’s apply those historical increases to today and project how high inflation could potentially be two years from now. If we matched any of those prior rates, here’s what inflation could look like by the year 2020, based on the current 2.38% CPI reading. If we matched the 1917 rate, inflation in the year 2020 would hit a whopping 40%. The 1947 increase would take us to 16.6%, exceeding what we saw in the 1970s and ‘80s. The 1974 rate would push us to 8.3%. Even the least of these increases would catch most people off guard; even though real inflation (when calculated with old formulas, including items like tuition, healthcare, and energy) is quite a bit higher, when’s the last time North America was in a soaring inflationary environment? Any of these scenarios would be good for gold, of course. And if we tip into hyperinflation, gold will still protect our purchasing power. 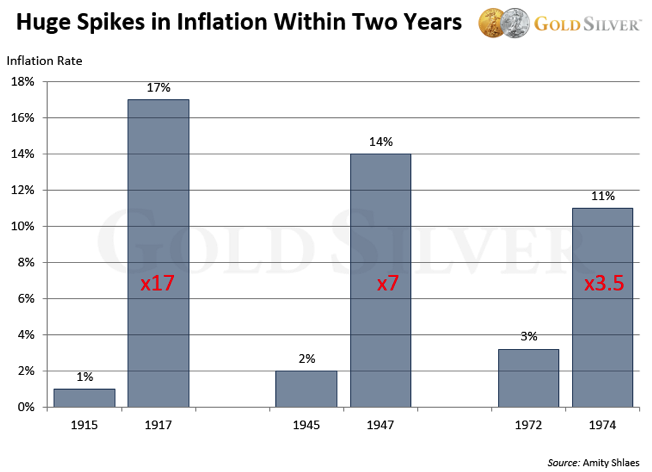 One of the surest predictors of when the gold price will rise is when inflation takes off. Given the massive amount of currency abuse that’s occurred around the world, soaring inflation is not some farfetched theory. Sooner or later we could easily become victim to a rapid and scary decline in purchasing power. Friends, history has a clear warning: Inflation will not stay dormant forever, and will likely pay a personal visit to your household soon. 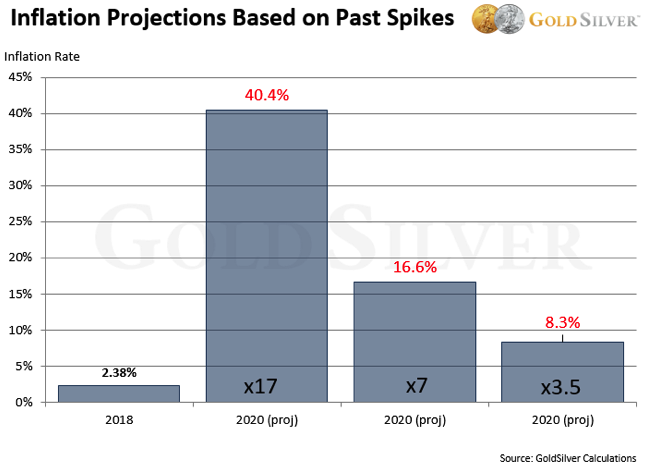 Do what Mike and I and everyone else at GoldSilver are doing and protect your purchasing power.